People collect all sorts of souvenirs when travelling. Some people collect picturesque postcards or paintings. Some collect magnets or even kitsch snow domes! When I set off on my travelling escapades, I decided to collect small bowls – dip bowls. I searched out and bought a bowl from (almost) every country I visited. I would seek out local markets and craft stores in search of the ultimate dip bowl as a way to remember my time in that country. Sometimes I would find absolute gems - like the handmade treasures I found at a small community market outside Lisbon. Then there were times when the over zealous locals would try and convince me that an ashtray was what I needed… Not quite what I was after but I enjoyed the chit chat! My quest for the ultimate dip bowls was fueled by my love of making dips – and of course eating them! If the right ingredients are used, they can be a delicious and healthy snack or a simple dish to enjoy with friends. Dips are the ultimate sharing food. I might be a little bias but I find that something special happens when you serve up dip. It is the same feeling when you pop open a bottle of bubbles – the conversation flows, people laugh and tell tales and just enjoy each others company. I have a number of recipes that I have tried out on my friends and family and one day (in the not so distant future) I am planning on launching my very own dip range - Watch this space! For now, whilst I find the time to get things off the ground, I am going to share with you some of my dip recipes. I hope you can get as much enjoyment out of making and eating them as I do. The first one for the files is my Roasted Sweet Potato and Cashews nuts. Enjoy with friends! Cut Sweet Potato into small pieces and place on a lined baking tray. Coat with olive oil. Get the garlic from the tray and squeeze out the cooked garlic pulp, discard the garlic skin. 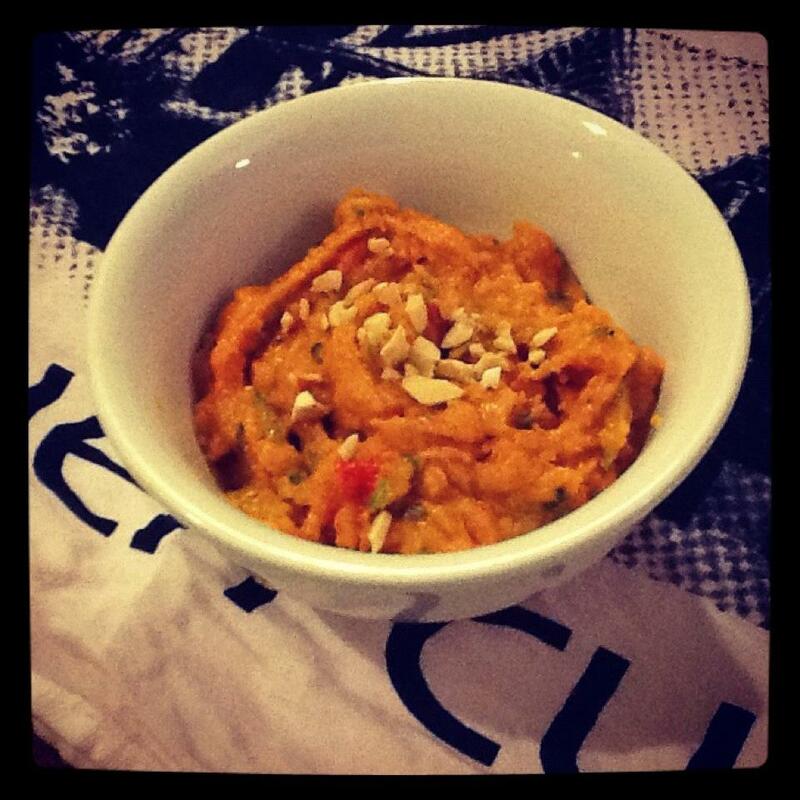 Put roasted Sweet Potato, roasted cashews, garlic and herbs into a food processor. Note: For a different flavour take, experiment with adding fresh chili, cumin or tahini to the blending process.